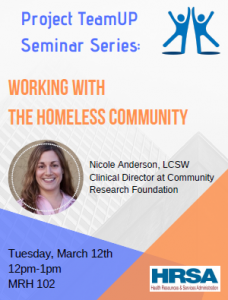 Nicole Anderson, LCSW, Clinical Director at Community Research Foundation has worked with the San Diego Homeless Community for the past 10 years and will be discussing how to support clients struggling with homelessness, including connecting clients to local resources. Please RSVP, as space is limited. If you have any questions, please email Lily Vistica at lilydancis@sandiego.edu.